“What’s a red weather warning?” I pondered, over a large plate of lamb curry in an Indian restaurant in Exeter. 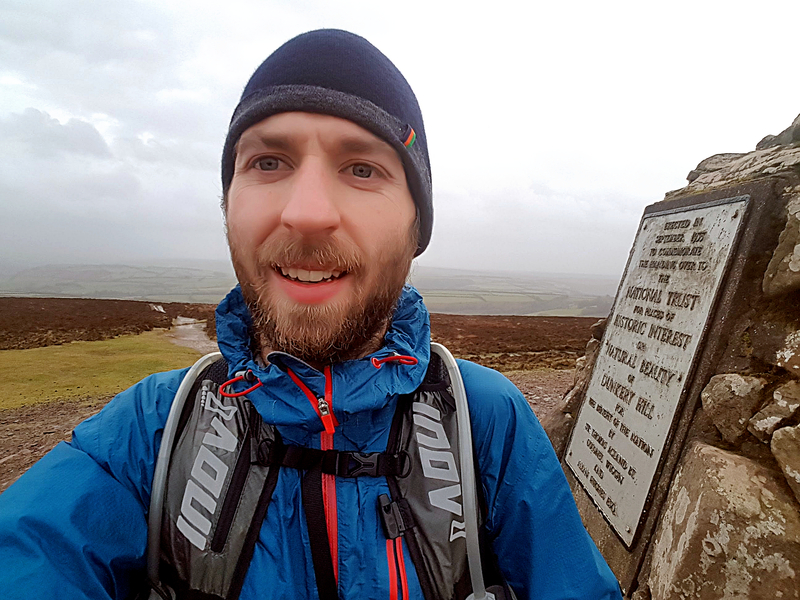 It was a wet and windy January evening, and I was preparing myself for a trip into the Exmoor National Park the following day in the midst of Storm Eleanor, the most powerful weather system to hit the UK so far this winter. I looked at the map. Porlock Weir, my planned starting point on the park’s northern coastline, was set to receive a head-on blasting from our Ellie as she tracked east. With the car park situated just behind the beach at sea level I decided this may not be such a sensible plan, and resolved to stop further up the hill at Porlock itself and run from there. I went to bed in my delightful Airbnb that night, with a belly full of wine and cheered by excellent conversation, wondering whether I’d actually be able to make it to my 36th county top, and if going into the eye of the storm was really a good idea at all. The next morning I was pleased to hear the worst of it had passed, however I was still wary of potentially volatile weather on higher ground. My target, the county top of Somerset Dunkery Beacon (519m), was forecast to receive gusts of up to 135kmph (85mph) over the afternoon, and the low pressure may spell sudden and serious changes in the conditions which could make for a rather eventful day out. Parking at Porlock Village Hall, I resolved to take things one step at a time and not to do anything stupid. After a short warm-up jog along the Coleridge Way to the west, I took the bridleway heading towards Whitstone Post from West Porlock. The going was immediately tough and I was reduced to a death-march up the steep, muddy slope through the woods and out onto the moor. My legs struggled to keep moving with the average gradient of 20% for more than a kilometre, but from the top the views over Porlock Bay were stunning and I enjoyed taking it all in once I had reached higher ground. After such a hard effort the long drop into Hawkcombe Wood provided some welcome relief and the mix of singletrack path and wooded switchbacks were a joy to traverse, but I was soon once again huffing my way skywards towards Lucott Farm. 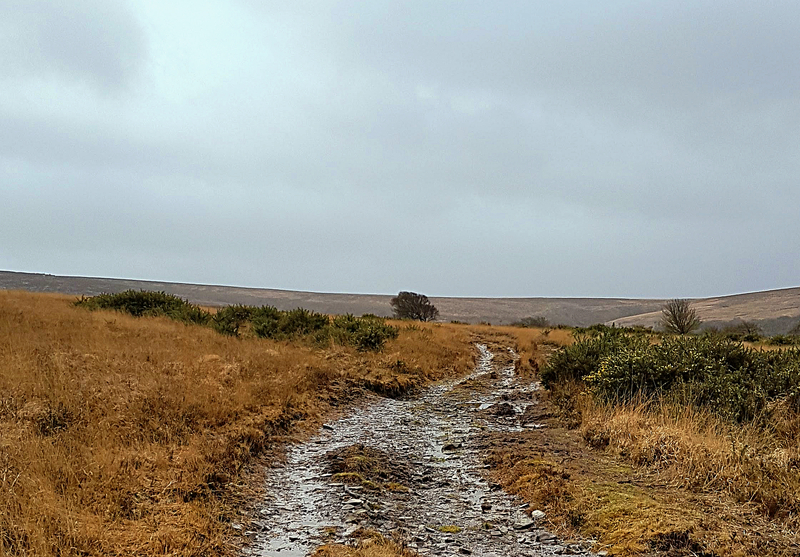 The byway towards Pool Cross sent me steeply down then up across a very slippery field, resulting in my first fall of the day – a low-speed slide into a big pile of sheep muck! The hills kept on coming, gaining a little more height each with each passing ridge: Down to Wilmersham, up via the tiny and oh-so-spooky chapel at Stoke Pero, down and across Bagley Combe, and finally up the long drag across exposed moorland to the Beacon itself. The temperature dropped, dark clouds threatened to unleash hell, and the wind blew hard on my back – it had been well over an hour since I had seen another soul and I progressed with caution in order to avoid hurting myself in this increasingly hostile environment. But, as seems so often to be the case, the trail running gods were smiling on me and as I approached the summit the rain subsided and the wind dropped to no more than an inconvenience. Visibility was good and the panoramic views over Exmoor were a sight to behold, so I paused to take it all in and shot some frozen-fingered photos. I began my return to civilisation by heading northeast towards the small road, then sticking on the parallel path to the car park at Webber’s Post. This spectacular singletrack took my breath away, and as I raced across its rocky spine I felt invincible – free as a bird and completely at one with my environment. … until I wasn’t. In the blink of an eye I tripped on a stone and was sent crashing to the ground, arms outstretched and braced for impact. I rolled through the mud and laid on my back for a few seconds, trying to process what had just happened. Did anything hurt? Yes – oh dear. How much? My hands, and my right knee – lots. Can I move them? Yes – phew. I picked myself up and surveyed the damage: Mud everywhere, and holes in my gloves… but nothing more, so I thanked my lucky stars and shuffled on. It had now been almost two hours since I’d seen another human. Rejoining the Coleridge Way I jogged back to town without much further trouble. The paths were muddy and covered in leaves, but the remainder of the descent was immensely enjoyable and I was pleased to be back in the woods and sheltered from the elements. As I re-entered Porlock I came across an Australian hiker and we chatted our way back into the village, exchanging stories from our day out in the hills and showing off battle scars – she too had fallen and had destroyed her glasses, cutting open her nose in the process. Later that evening I reflected over my day’s journey, with its many trials and tribulations – ups and downs in both the literal and metaphorical senses. In many ways it was a needlessly difficult route to have chosen, especially in wintertime, and I resolved to return in more pleasant summer weather to experience some type one fun in the hills. But perhaps the struggles were what had made it such a rewarding day out – in my war against Mother Nature, I lost a few battles along the way but had ultimately emerged victorious. You could easily shorten this route: a loop from Webber’s Post would be a lot of fun and a good challenge in itself, or you could take a more direct route to the summit from Porlock, but I was pleased to have had an adventure befitting of the majesty and emptiness of this remote corner of England.